On March 24, 2017, Deposit Booster Corporation joined DavidNews.com, as of today, the project has been online for 4 days. It’s Golden Stage project, which impressed me with the communication style. I must admit that the space theme and the spacecraft as a part of the website design are something unusual for the industry. At the moment I have reinvested in this program $400 and will keep an eye on it. Therefore, I would like to get down to the spaceship and plunge into space. Please, follow my path and see if there is a potential to benefit financially from this program. Right after opening the website you see a spacesuit floating into the space and some sort of a vortex, which can fast forward you somewhere else in the space. I believe it’s an allegory linked to their name – Deposit Booster Corporation. You make an investment and get the boost out of it by earning money from the interest fee. The tagline is clear, but what about the unique selling points? Well, they promise creativity, validity, and profitability! To be honest, I’m not very conservative in terms of web design, and I was glad to see a website like this. However, the bottom line is that these design elements do have an impact on page load time, which might be way above the average when using slow internet connections or mobile traffic. I’m saying it because the vortex and flying man was not moving smooth, but freezing once in a while! I’m thankful to any website owner that decides to put extra effort by making the website responsive. 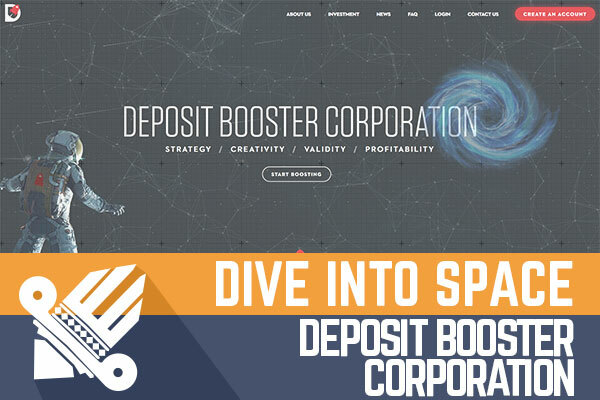 Deposit Booster Corporation is one of those websites, where website content will adjust accordingly to your devices. However, I already mentioned that some elements are freezing for a moment event though I have a pretty fast internet connection. This happens only at the beginning when you load a page. The flying spacecraft might be the reason for it. So far I must admit that I haven’t noticed similar layouts anywhere else. In the meanwhile, the administrator is using licensed GoldCoders script. Of course, there is nothing bad about it. Especially, if the admin finds a ready to go script, which is functional enough for a particular program. As a matter of fact, the company details on the website match the UK company registration info. The company has been registered at the beginning of this year on January 18 and is active. Also, the company address from the register matches information on the website, which is good and seems more legit then HYIP’s without company registration or fake names that can’t be found in registers. Regardless the real company information, we will never have 100% guarantee that our investment will make a profit and we can sleep tight. However, as an aspect of credibility, it works way better than a social media profile with 20K likes and only a couple of tweets. In fact, Deposit Booster Corporation currently has no social media accounts. Nevertheless, it can't stop admins from gaining plenty of registered users if they can reach their target audience through other channels of online marketing. So far so good, right? I believe you want to see less talking around and more numbers. The question is can you make money with Deposit Booster Corporation and how much can you make? First, you can make an investment from as low as $5 up to $50 000. Second, you can make payments using PerfectMoney, Bitcoin, Payeer and AdvCash. Finally, the program has 3.5% daily interest rate for as long as 40 days. To give you an example, $50 deposit will generate $1.75 a day for 40 days, which means that after 40 days you will earn $70. Since initial deposit is included in the payments, you will have earned $20. It doesn’t seem much, but it’s a totally different game when you are investing a few hundreds. I have mentioned it already in my previous HYIP reviews, that I see a great potential in programs, which keep the initial deposit. Simply the probability of many large withdrawals at the same time is lower. Overall impression of the program is positive. I have highlighted mostly the bright side of the program. However, I can’t see much of the dark side for such young program. Also, there is only a small buzz around it online because it has been running only for 4 days. In the meanwhile, I’m a little bit skeptical about their potential of going viral due to the overall communication approach. All this cosmic theme seems attractive to my eye, but you need to dig deeper into the About us or FAQ pages, in order to find out the fact that the administrators are making a profit by trading cryptocurrencies. I’m sure you can make money out of it, but it should be communicated in a much more simpler manner for beginners to HYIP world. As I wrote earlier, it’s a totally subjective thought of this program. As usually, keep it mind that all programs are made to make money. Evaluate investment risk and invest fund that you can afford to lose! Investment plans: 3.5% daily for 40 calendar days, initial deposit included in the payments. 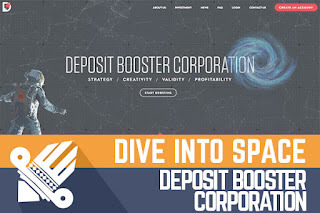 Join Deposit Booster Corporation Here! You can earn from $5 to $75 per each survey! Over at Free Bitcoin you may get free bitcoins. 8 to 22 satoshis per 5 mins. Did you think about choosing the ultimate Bitcoin exchange service: YoBit. Have you ever considered maximizing your free bitcoin collections by using a BTC FAUCET ROTATOR?